Higgins Corporation is a leading supplier of desktop thermal barcode label, wristband and tag printers, media, label design software and other peripherals sold under the market name of E2. The E2 is a line of versatile and configurable printers that provide outstanding printing solutions for small, as well as large operations. Whether you need Medical ID Bracelets, Wristbands or other identification labels, we can provide an E2 printer to fit your needs. E-2 M7 is a powerful, full featured, high performance printer offering great value. 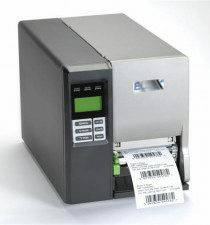 Its low profile still handles an OD label roll, delivers fast throughput making it ideal for any high volume application. The E2 M8x Series is perfectly suited for mission critical applications. Built with heavy duty die-cast aluminum and a performance processor resulting in tremendous print speeds. It also features a 4.3″ color LCD and touch panel operation.